I am at the sit-in at the army headquarters now - on the street opposite the naval force headquarters. It is pointless for [President] Omar al-Bashir to continue using his thugs to get us off the streets as we are not going anywhere. I'm hoping he will give up. I don't want to disclose where I am, for my own safety. Not everyone in the army supports us - it depends on their rank. The highest ranks are supporting the regime while other ranks joined the protesters. The protesters haven't left the army headquarters since 6 April when more than 800,000 people gathered there. 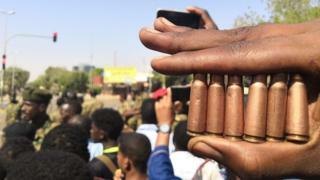 This is the biggest protest against the government in the history of Sudan - bear in mind that in 1964, and in 1985 we overthrew two governments through revolutions. The government doesn't care about Sudanese people getting killed. What they care about is staying in power. That's why I'm afraid it's going to become a conflict between the good people from the military and the other militias. The types of people participating are so diverse - a mix of ages, religions, classes, ethnicities and gender. This sit-in shows a lot of who we are as a nation - our resilience, courage, solidarity, community and commitment to change for our country. The bullets have not deterred the numbers - on the contrary they are creating more resolve.